Project level code templates are available in autocomplete only for the respective project. You cannot use them in other projects - as opposed to Global Code Templates. To see the list of project level code templates Right-click on a project in Navigator > Properties > DVT > Code Templates. Click the New button to define a new template. NOTE: The template name is important for autocomplete proposal filtering based on already typed text! See more details here. 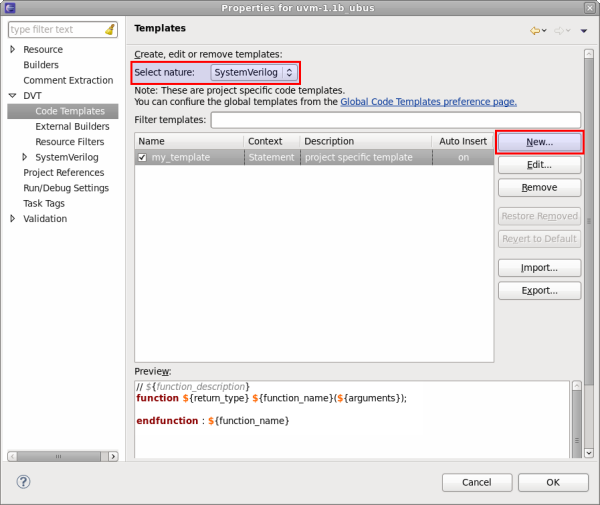 After selecting a template, press Enter and it is automatically inserted at the current position in the active editor.